Soon after the end of the Vietnam War in the early 1970s, a group of veterans started an organization to build a memorial to the individuals who served in the conflict. Congress, in July 1980, authorized a site in Constitution Gardens near the Lincoln Memorial, guaranteeing a parklike setting. 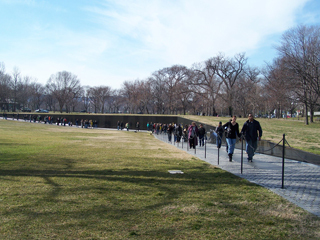 After a national competition, a design was selected for the memorial, which has become one of the most visited sites in Washington. The winning design, by Maya Ying Lin of Athens, Ohio, was approved--with the addition of a flag staff and figurative sculpture--and construction began in March of 1982. The site was dedicated on November 13, 1982. The two simple black granite walls of the memorial--each 247 feet long--point to the Washington Monument and Lincoln Memorial. Every day, Vietnam veterans, their families, and friends leave mementos and tokens of remembrance at the memorial, and take rubbings of the names on the walls. It is an unusual and highly emotional site that inspires millions of visitors each year. A sculpture near the entrance of the memorial by Frederick Hart commemorates the experience and service of Vietnam veterans.